NEW YORK—Commuter rail traffic will resume between New York and Connecticut in time for the a.m. peak on Wednesday, according to a statement from the MTA. The line has been down since a Friday evening rush hour crash in Fairfield, which injured 72 people. Commuters struggled Monday to find transportation, and many commuters reported rides to work and back home took far longer than on typical days. 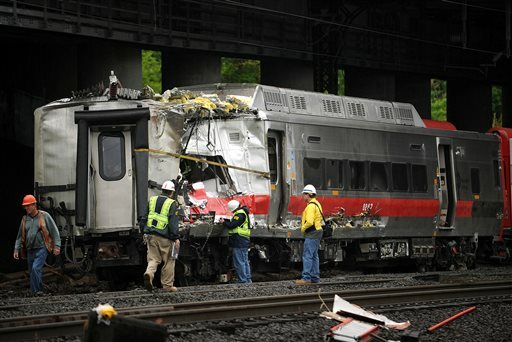 Some used a jury-rigged alternative to the trains: A shuttle train ran between New Haven and Bridgeport, where a bus connection to Stamford circumvented the accident site, and finally customers boarded a train for New York. That system was to continue Tuesday. The MTA reported 120 buses in service with no crowding. About 750 people rode the shuttle trains and boarded buses at Bridgeport to Stamford, just 20 percent of the 4,000 people who ordinarily board trains at New Haven, Milford and Stratford during the morning peak. “The local municipalities offered tremendous support, with signs, special lanes, satellite parking and police assistance and Metro-North is grateful for this very high level of cooperation, which ensured the operation’s success,” said Susan Doering, Metro-North’s Vice President of Customers Service and Stations in a statement. For Gary Maddin, the drive from his home in Milford to the Bridgeport train station normally takes 20 minutes. On Monday, it took an hour. Then he had a shuttle bus and a train ride before he got to his destination, Grand Central Terminal in New York. The MTA said a.m. peak ridership on the entire New Haven Line was down just 20 percent, meaning many drove to other stations. State officials nervously watched heavy traffic on two major arteries in southwest Connecticut, Interstate 95 and the Merritt Parkway.